Asteria was a second generation Titan goddess from Greek mythology. Once chased by Zeus, she is arguably more famous for being the mother of Hecate, the Greek goddess of witchcraft. Asteria was born during the Golden Age of Greek mythology, the period when the Titans under Cronos ruled the cosmos. As such, Asteria was the daughter of the Titans Coeus and Phoebe, and therefore sister to the goddess Leto, and the occasionally named god Lelantos. Asteria’s name means “of the stars” or “starry one”, and Asteria was named the Greek goddess of shooting stars; more importantly though Asteria was also closely associated with divination by dreams. A major place dedicated to the worship of Asteria was on Delos where an oracle of dreams was to be found, and there was a close association between Asteria and the island of Delos, as will be explained later. During the rule of the Titans, Asteria was said to be partnered with Perses, another second generation Titan, the son of Crius and Eurybia . Together, Asteria and Perses would become parents to a single daughter, Hecate the Greek goddess of witchcraft and magic. 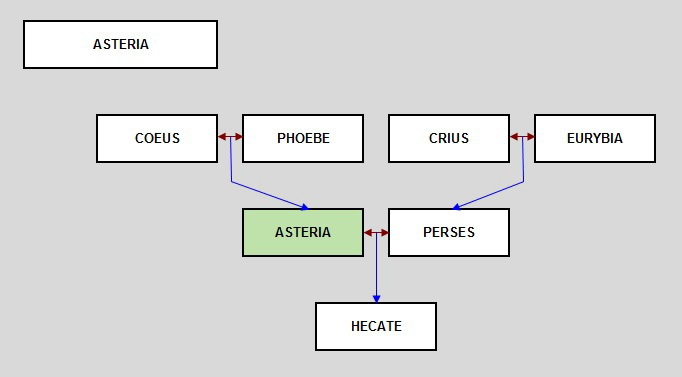 The rule of the Titans would end with the Titanomachy, but this would not greatly impact on the female Titans, for indeed Hecate, the daughter of Asteria, would remain widely revered. Asteria herself was given an honoured position upon Mount Olympus. Being on Mount Olympus though brought the goddess into the close company of Zeus, and Zeus was always on the look out for beautiful women. To escape the unwanted attentions of Zeus, Asteria transformed herself into a quail, and flew from Mount Olympus, before plunging into the sea. Some say at this point Asteria was transformed again into a floating island, whilst others say that with Asteria now being in the domain of Poseidon, that the Greek sea god took up the chase of Asteria, and so she was transformed into a floating island so that she could move away from the advances of Poseidon. The floating island would be known as Ortygia (the Greek for quail); and a number of places in antiquity would claim to be Ortygia, but to reconcile the myths, the island of Ortygia would at some point be renamed Delos. Asteria, as Delos would, move around the Mediterranean, but would be a rather barren, uninviting place. This though would change when Leto, Asteria’s sister came to the island. 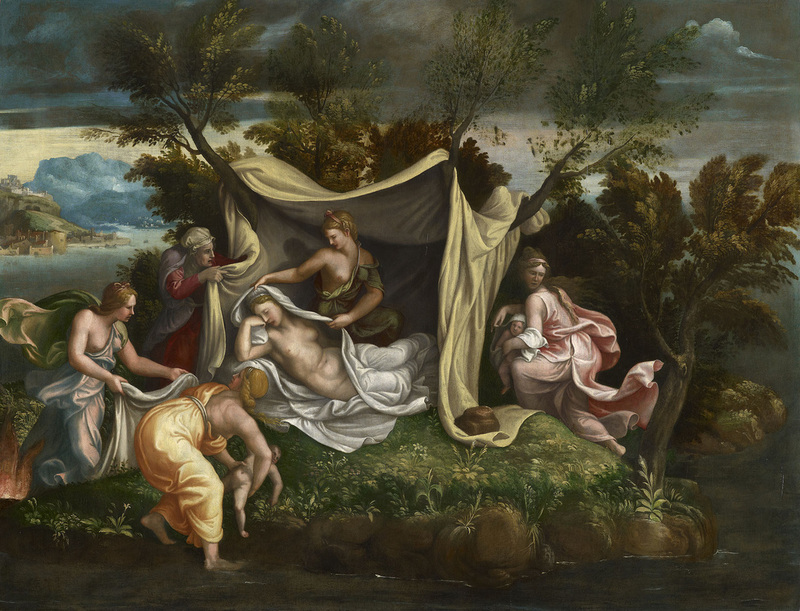 Leto was pregnant by Zeus, but Hera had forbidden any place of land or sea from giving sanctuary to her husband’s mistress, and so Leto was unable to give birth to her children. Asteria, as Delos, was not worried about the wrath of Hera, but was more worried that if the son of Leto was to be as powerful as foretold, then he might decide to destroy the island for its ugliness. Leto promised Delos that the island would be revered for evermore if she allowed her children to be born there; and so Leto gave birth to Artemis and then Apollo upon Delos. As the new Olympians were born, so the pillars attached Delos to the sea’s floor, and so Asteria would no longer wander the seas, and the island began to flourish. Thereafter Delos was a sacred place for Apollo, Artemis, Leto and Asteria.